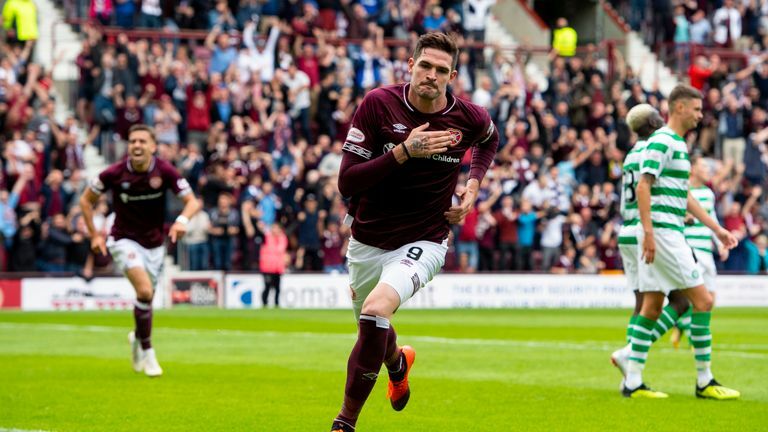 Kyle Lafferty is having a medical at Rangers on Wednesday after they agreed a fee with Hearts for the striker, according to Sky sources. The deal for Lafferty to return to Ibrox could go through on Wednesday afternoon with personal terms not expected to be a problem. Gers boss Steven Gerrard said in his press conference that he was hopeful the deal could be completed in time for him to be available for Thursday's Europa League first-leg play-off tie against FC Ufa. Gerrard said: "It's very close. Verbally there's an agreement in place, but when you get that verbal agreement there's still bits and bobs to do around it so until we get the green light there's nothing to announce. "Lafferty knows what this club is about, there's no risk in terms of him performing in front of this crowd and this club with the expectation. "He brings vital experience to us. He's a Rangers nut, he's desperate to come and I think he ticks all the boxes that I'm looking for and what I want from a front man. "We know we're quite bare up there without him so that's the reason we want him." Hearts rejected an initial £200,000 offer for the Northern Ireland international last month but Craig Levein confirmed last week that the two clubs were still in discussions. Lafferty previously played for Rangers from 2008 until 2012, making 138 appearances and scoring 38 goals. He won three Scottish titles, two League Cups and a Scottish Cup during a successful spell in Glasgow. The 30-year-old joined Hearts last summer after spells at Sion, Palermo and Norwich City and scored 19 goals last season for the Tynecastle side. He scored the only goal of the game as Hearts beat Celtic earlier this month.